A Slamdance 2013 Official Selection, “Big Words,” enjoyed an international tour last year, and following its theatrical release in the USA, it was seen in the UK and Sierra Leone. The Brooklyn-set “Big Words” centers on members of a once-promising hip-hop group, now in their late 30’s, struggling with regret, disappointment and change, set against the backdrop of Election Night, 2008 – when Barack Obama was elected. The film stars Dorian Missick, Yaya Alafia, Gbenga Akinnagbe, Darien Sills-Evans, Zachary Booth and Jean Grae. Storm Saulter’s debut feature, the acclaimed “Better Mus’ Come,” tells the tale of a collision of passion, politics and poverty, in a tumultuous 1970s Jamaica, when rival gangs enlisted by warring political factions disrupted the democratic process. Better Mus’ Come stars Sheldon Shepherd, Nicole Grey, Ricardo Orgill, Everaldo Creary, and Roger Guenveur Smith. 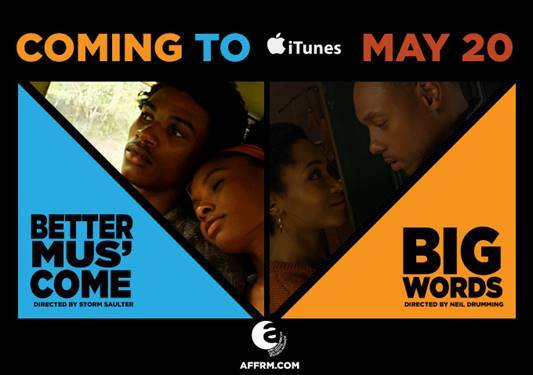 AFFRM’s first picks of 2013 counts among its accolades, Best Feature Award winner at the Trinidad & Tobago Film Festival and the Bahamas Intl Film Festival; Best Director Award at the Pan-African Film Festival; and the Best Actor Award at the American Black Film Festival. Look for both films on iTunes. This sounds promising. Anything that will show more movies featuring characters/people of color in non-stereotypical roles is a plus as far as i’m concerned.